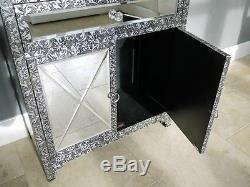 Embossed mirrored cabinet featuring one drawer with a crystal knob and one storage compartment with a double door. This stunning range is inspired by Morrocco featuring a wonderfully embossed finish and silver patterned detailing in black and silver. 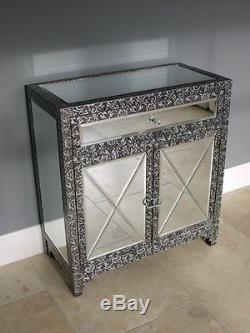 This retro cabinet has that ultra contemporary yet decadent feel that will embellish any room bedroom, bathroom, hallway, living room, etc. 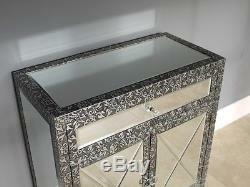 Mirrored top, sides, doors and drawer. 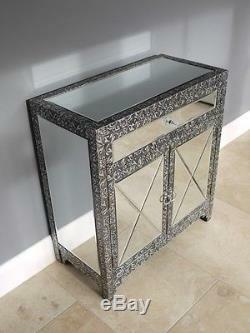 Ornate blackened silver embossed finish. This product is dispatched using a tracked courier. 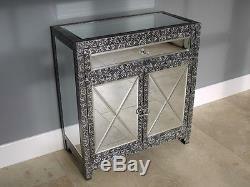 Tracking details will be sent once the product is dispatched. This product can be delivered for free to Zone 1 UK. This covers England, Wales and some parts of Scotland. If you live outside of these areas there may be an extra charge. We aim to resolve any problem as quickly as possible. This means you can return the item in original condition to us within 14 days of receipt. 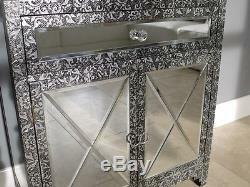 The item "2 Door 1 Drawer Mirrored Storage Cabinet Vintage Silver Chest Embossed Cupboard" is in sale since Friday, July 21, 2017.